The item Harley Quinn, Volume 2, issue 8-13, Joker loves Harley, Jimmy Palmiotti, Amanda Conner, writers ; John Timms, Chad Hardin, Brandon Peterson, Moritat, Bret Blevins, Jospeh Michael Linsner, Michael Kaluta, Inaki Miranda, Andrew Robinson, artists ; Hi-Fi, Alex Sinclair, Andrew Robinson, colorists ; Dave Sharpe, letterer, (electronic resource) represents a specific, individual, material embodiment of a distinct intellectual or artistic creation found in Kent District Library. 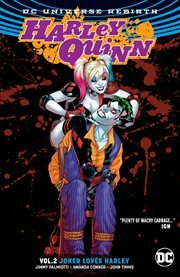 Exploding from the blockbuster DC Universe Rebirth event from the best-selling creative team of Amanda Conner, Jimmy Palmiotti and John Timms comes HARLEY QUINN VOL. 2: JOKER LOVES HARLEY. It ain't easy being the world's most psychotic psychiatrist, but hey, Harley Quinn just might pull it off. With her tight-knit Coney Island crew and her gal-pal Poison Ivy by her side, things are looking up for the mistress of mirth and mayhem. From nudist colonies to roller-derby rinks, she's livin' the good life. But the joke's on her. That's right, folks: the Clown Prince of Crime has come crawling (and killing!) back into Harley's life. This time around, the Joker's promising to show her a kinder, gentler side of himself-the stuff that made her fall for him in the first place, back when she was his shrink and he was her most dangerous patient. Can Harley trust her ex? (Please!) Will she ditch it all to join him in his war on sanity? (Again!) One thing's for sure: if the Joker betrays her again, this time puddin' will go SPLAT! Comics' craziest couple reunites (or do they?) in HARLEY QUINN VOL. 2: JOKER LOVES HARLEY!